Losing teeth is a nightmare for everyone, regardless of the reasons behind it. Lack of proper dental care and regular dental check-ups contribute to the decline of oral health that leads to the loss of teeth for many. Due to specific health issues, accidents, and ageing, some people experience teeth loss. Regardless of the reason, teeth loss affects the quality of a person’s life as they can’t enjoy some food items. Teeth loss also affects their social life as they feel less confident in interacting with others. It’s a fact that the loss of teeth is considered as an indication of poor dental hygiene and ageing regardless of the reasons. Due to that, people don’t feel happy with teeth loss and search for solutions to get quality, healthy teeth replacement options. Are you searching for dental replacement options to get to improve the quality of your life? Let’s discuss one of the most popular dental replacement options called dental implants and see how the implants can help you to bring back the bright smile to your face. 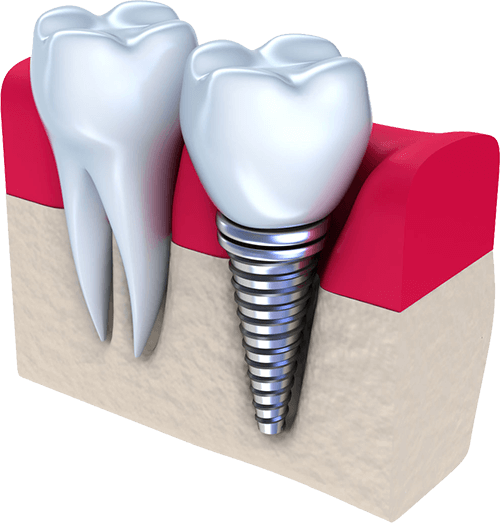 Dental implants are small screws that are fixed in place of missing teeth. Each missing tooth should get a dental implant. However, there are novel techniques to replace the complete row of missing teeth without as many dental implants. The finest example of such techniques is all-on-4 dental implants available in Melbourne dental clinics. It’s a well-accepted teeth replacement option with highly promising results. Dental implants work like tooth roots and provide support to the dental crowns mounted on them. As a patient with missing teeth, you have the option to choose both metal and non-metal dental implants. While titanium implants are the option for people who want metal implants, zirconia is the choice for patients who need non-metal options. Though titanium implants are known for excellent durability, some people prefer non-metal implants due to their need for a more natural solution. • Dental implants provide excellent durability and are long-lasting. Most titanium implants can last for 25-30 years. If you give it proper care, it can last for a lifetime. • Dental implants give an improved appearance to your face and provide you with the feel of a natural tooth. The implants fuse with your jawbone and work like permanent teeth after the recovery period. • Patients don’t face any falloff of the dental implants compared to removable dentures. As the implants are permanently fixed into the gums and jaws, the patients feel better control and improved confidence. • Compared to other dental replacement options, patients who choose dental implants don’t face issues like difficulty in chewing, mumbling or slurring of words, slip of teeth, and other issues. Altogether, dental implants provide excellent comfort to patients. • Dental implants improve the overall oral health of patients. Since the implants are affixed onto the jawbone, it prevents the jawbone reduction over the time – due to the absence of a tooth root for long. Also, dental implants don’t need any alteration of the nearby teeth to fix it. • Compared to other dental replacement options, implants need minimal maintenance. Regardless of these benefits, a few patients don’t think dental implants are the right choice for their missing teeth. People with poor bone health or low bone density can’t choose dental implants to replace their teeth. Such bones can’t support dental implants or hold them securely in place. Several studies show that dental implants have an excellent success rate – up to 98 percent. Through a minimally-invasive dental procedure, your dentist can fix the implant into your jawbone. Compared to other tooth replacement treatments, dental implants show fewer complications in the long term. Novel procedures like all-on-4 have increased the popularity of dental implants and address some of biggest challenges of dentistry in a better way. All-on-4 is a great technique where you get a full array of teeth with just four implants. Reviews for all-on-4 dental implants from around the globe show that the technique is the primary choice for patients who have significant teeth loss. You can get the fixed full-arch prosthesis with a single surgery that usually takes 1-2 hours. All-on-4 is also the best choice for people who are struggling with terminal dentition issues. The dental implant process – both individual implants and all-on-4 – starts with a personalised treatment plan. Your dental specialists will assess your teeth and specific requirements and create an implant option that can provide you with the best results. In the treatment process, your dentist will fix a tooth root – a titanium or zirconia screw – onto the jawbone where your natural tooth is missing. During the recovery period, the implant will fuse with your jawbone and start functioning as a natural tooth root. Note that the healing and recovery usually take 6-12 weeks. After the implant is fused with the jawbone, an abutment – a small connector post – is mounted on the implant. It helps the implant to hold the new crown securely and safely. Your dentist will take the impressions of your bites and create crowns based on that. Once the crown is ready, your dentist will attach it to the abutment. In the all-on-4 procedure, the dentist will take x-rays and digital images of your gums and jawbones to analyse your oral structure and prepare dentures based on your requirements. The dentist will perform minor surgery – bone reduction process – on your gums that include proper shaping your jawbone to fit the implants. They will then fix the dental implants onto your jawbone – the entire process may complete in a single dental visit or a couple of visits. The dentist will usually put temporary dentures on the implants until the healing is over. During the recovery period, the dentist will examine you at regular intervals to see any all-on-4 dental implants problems and provide you with the necessary corrections. Once the implants are fused to your jawbone and the permanent dentures are ready, your dentist will place the crowns on the implants. Dentists use tooth-coloured, natural-looking dentures that can last for many years to give patients durable results. Regardless of if you want individual implants or all-on-4, you may not find them to be the right choice in a number of reasons. As discussed earlier, people with low bone density don’t find dental implants the right choice for their needs. However, many dental clinics for all-on-4 dental implants in Melbourne offer bone grafting treatment to improve the bone density for such patients. Also, some dental clinics offer mini implants with a lesser diameter, compared to regular implants, for managing the low jawbone density. While regular implants measure 4-5 millimetres of diameter, mini implants come with less than 3 millimetres of diameter. In conclusion, you should have sufficient jawbone density or should achieve it through bone grafting to go for a dental implant procedure or all-on-4. Also, you should have good oral health and shouldn’t have any periodontal disease, which is a type of gum disease. People who are heavy smokers experience slow healing and recovery than usual. Sometimes, heavy smoking can cause dental complications and lead to implant failure. You should also note that non-smokers get lasting results with their dental implants. People with chronic disorders, such as heart disease or diabetes, should consult with their dentist. According to the evaluations of their dentist, the patient can go for dental implants. It’s also applicable for people who receive/received radiation therapy in the neck or head. Note that all-on-4 is a treatment option when there is a significant loss of teeth in a row. Dentists perform dental implants after administering local anaesthesia in most cases. For all-on-4 dental implants, dentists use either local or general anaesthesia based on the complexity of the procedure. While the recovery time for single implants is 6-12 weeks, all-on-4 implants may take up to 6 months. The medical condition of the patient, the treatment methodology, the materials used for the treatment, and the condition of the jawbone can influence the recovery period. People who go through bone grafting – before the implants – often require more time to recover. Once the implant procedure is complete, the patient should make regular visits to their dentist for evaluating the recovery. Dental implants are the option for people who want permanent, long-lasting tooth replacements. The expertise of dentists in implants procedures as well as the use of technology define the success of the procedure and assure you with the best results. Care Family Dental in Melbourne combines qualified and experienced dentists with state-of-the-art systems and tools. It means that you get a guaranteed, permanent solution to your missing teeth while receiving a personalised treatment experience. Interested? Call us today on (03) 9999 3324 or contact us online to book an appointment for a consultation. You can also discuss your thoughts, concerns, and issues with us, and we are here to offer you a quality, relaxed treatment experience.